Dr Timperley is a Consultant Cardiologist and CAA Aprroved Aeromedical Examiner, authorised to undertake initial and renewal of class 2 medicals and renewal of class 1 and 3 medicals. He is also available to perform LAPL medicals. Having served in the Royal Air Force for 20 years, leaving the service as the Senior Consultant Cardiologist, Dr Timperley has a vast experience in managing aviation cardiology issues. He lectures on the cardiology sections of the Basic and Advanced Aviation Courses at King's College, London, and on the Diploma of Aviation Medicine Course at RAF Henlow. Dr Timperley is also a keen pilot having flown his first solo in 1995. He currently flies from RAF Halton and during his RAF career has experienced a multitude of different aircraft types. Dr Timperley studied medicine at University of Leeds where he obtained MB ChB in 1994. During a 20 year service in the Royal Air Force, Dr Timperley underwent junior training posts and then undertook specialist training at The Royal Brompton Hospital in London, Derriford Hospital in Plymouth and 6 years at the John Radcliffe Hospital in Oxford. Dr Timperley was awarded his research Doctorate in Medicine (MD) with commendation in 2007 from the University of Leeds for his research into the use of advanced echocardiography techniques for the diagnosis of heart disease. He has over 40 peer reviewed publications. He is an active member of the British Society Of Echocardiography, British Cardiovascular Society, British Heart Rhythm Society and the Association of Aviation Medical Examiners. He is also an instructor and course director for Advanced Life Support (ALS). Dr Timperley works at Northampton General Hospital where he has been appointed as the Clinical Director for Urgent Care and Clinical Lead for the Emergency Assessment Units. 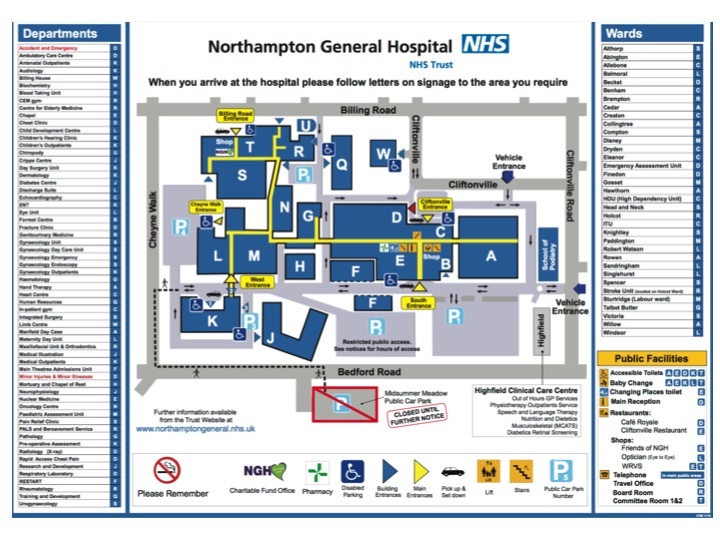 Northampton General Hospital is a large District General Hospital, which includes the Northampton Heart Centre. Whilst basic cardiac investigations are performed at Kingswood (ECG, 24 hour ECG, 24 hour ambulatory BP monitoring), more advanced cardiac investigations are performed in the Northampton Heart Centre. We are based in Cliftonville, Northampton within easy walking distance to Northampton General Hospital where cardiology investigations are performed (and audiograms when required). Free parking is provided at the rear of the premises. Whilst awaiting your appointment, feel free to enjoy a complimentary coffee. A chaperone is available for all daytime appointments (we do not have a chaperone for Monday evening appointments).